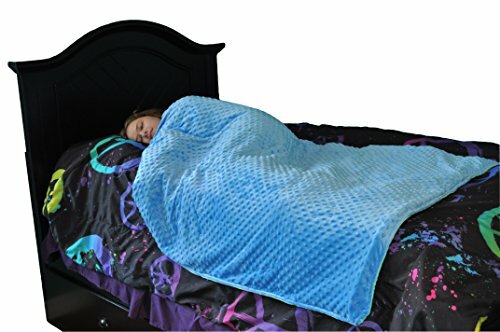 Weighted Blankets Pros and Cons - Can they help with anxiety? 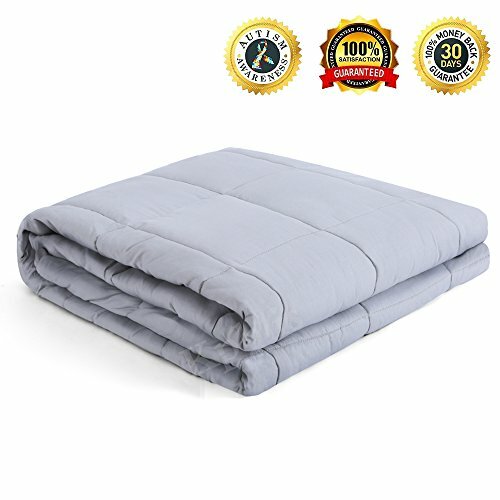 We recently purchased a weighted blanket for our son, we were advised to buy one to help him sleep at night because his ADHD and Autism kept him awake at night. He feels very nervous and anxious at night and is always fidgeting until the early hours of the morning. A friend of ours whose daughter uses one told us about a WEIGHTED BLANKET they bought from Amazon and said it worked wonders for their daughter who also has ADHD. So we decided to research if they work and if weighted blankets had any Pros and Cons. In this review, we will share with you our findings and how the weighted blanket helped our son sleep. After spending a few days researching and watching youtube reviews on weighted blankets for children with ADHD we were reassured by our findings. As we own and run Our Eczema Story an eczema support website for people who suffer from this terrible skin condition after myself and our son have struggled with eczema for years. We thought we’d share our findings as it may help some of our readers. Anyone suffering from Eczema or any other skin condition often struggle with anxiety too. In this review, we will give you all the weighted blankets pros and cons and tell you how and why they work. We will also share the best weighted blankets we found online to help you save time and money. If you’re in a hurry then click the link above to be taken to the best ones we found at the best prices. However, if you’d like to know why they work and how they can improve your sleep, then read on. They improve our mood by triggering the release of serotonin and dopamine which are neurotransmitters that are highly involved with how we feel. Material-Find the type and feel of material your child will like. These are the weighted blankets pros and cons, the pros definitely outweigh the cons for us. They are blankets that are filled with heavy inserts like beads or pellets to weight them down. They have a cover which can be removed and washed. The beads are lock inside the blanket and can’t come out. We noticed whilst play fighting with our son how he liked us rolling on top of him. He would often play fight with his mum and if she got on top of him he would stop struggling so she stayed on top. When asked why he liked her on top, he said ‘it was a comforting feeling‘ it made him feel safe apparently. Occupational therapists often use weighted blankets as a means to help children with sensory disorders, anxiety, stress, or issues related to autism, and research continues to support this practice. DPTS- Deep touch pressure also causes the release of both serotonin and dopamine in the brain. These are “happy” neurotransmitters and produce a feeling of calm within our nervous system. Depression, anxiety, aggression, OCD, PTSD, and bipolar disorder have all been linked to low serotonin levels in the brain and weighted blankets have been proven to increase serotonin levels. 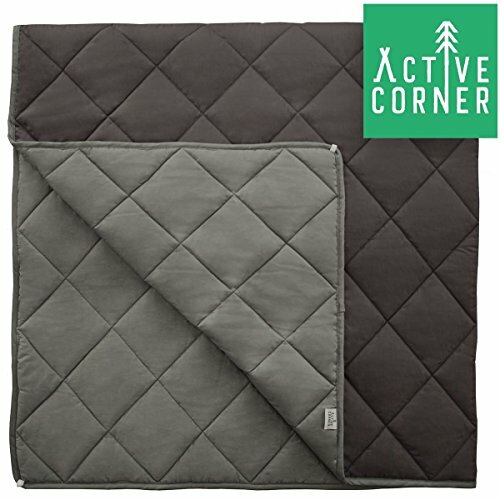 Can anyone use a weighted blanket? Yes, Everyone has Deep pressure sensory tissues and can benefit from the calming feeling of weighted blankets. Have you ever had a thick heavy duvet and climbed into it on a cold night and felt the weight on your body? It has a gentle calming feeling, right? Weighted blankets offer the same sensation but even more enhanced. This being said they have the most positive impact on Children and Adults with ADHD, Anxiety and other mental health conditions. What size and weight should I buy? A general guideline for choosing the correct size and weight of a blanket is to buy one that’s 10% of the user’s total body weight. ie: A child that weighs 80LB’s should buy a 10LB weighted blanket. This is a general guideline and should be judged by the reaction from your child. Some will like heavier blankets and some less. There is no real way of knowing but start with the 10% rule and you won’t go wrong. What should you look out for when buying one? The type of material and style will be one thing to consider. You son or Daughter still need to like the look and feel of the material, no matter how good they work. It still has to be comfy and attractive to the user. Many children with Mental Health conditions often suffer from conditions like sensitive touch and hate the feel of some material. So this must be taken into account when buying a weighted blanket. You’ll also need to check if the blanket is machine or hand washable. Where’s the best place to buy a weighted blanket? Proudly made in the USA! WEIGHTED BLANKETS SHOULD NEVER EXCEED 15% OF INDIVIDUAL'S WEIGHT. The formula is 10% of your weight, plus 1. Ask yourself if you like the feeling of a lot of pressure, if so select a medium or high-pressure blanket, if not use low pressure. When in doubt of best weight for your needs choose a light pressure option. Pressure options available in small, medium, large and extra-large sizes. Whether it's for adults or kids, we have something for everyone. 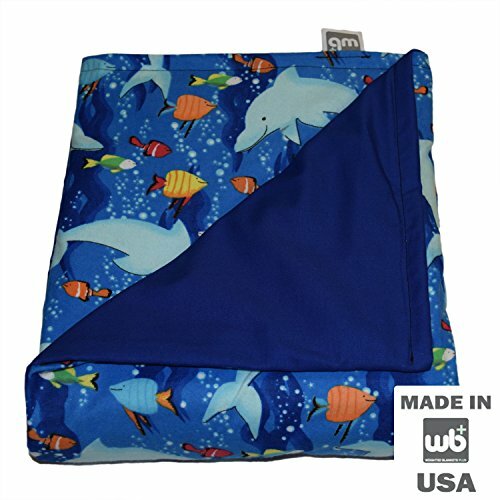 WB+ WEIGHTED BLANKETS provide soothing weight and pressure to stimulate a great night's sleep. Produces relief and relaxation. It really is the BEST HUG EVER! 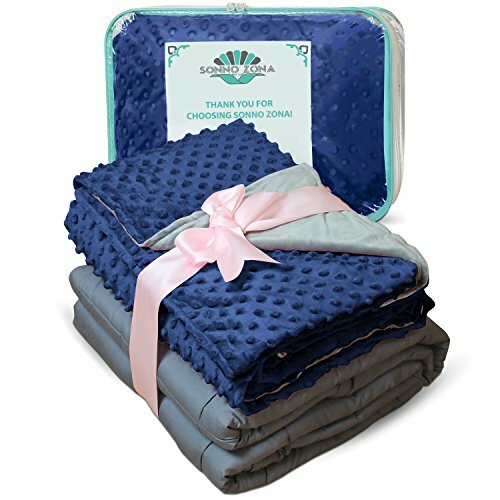 100% HIGH QUALITY, AFFORDABLE PRICE, durable cotton and cotton flannel blankets are both calming and comfortable, filled with evenly distributed, sugar-like glass beads, no extra poly-fill. Our beads are divided into hidden 4"x4" squares. No extra purchases needed for a complete blanket. Sized for individual use. Small 48"x30", Medium 58"x41", Large 72"x42" and XL 80"x 58". 100% Satisfaction Guaranteed. Email the staff at Weighted Blankets Plus today at helpmesleep@weightedblanketsplus.com to learn more! RECOMMENDED WEIGHT/SIZE - The weight of the blanket you order should be 7%-13% of your weight, which would help you sleep better and faster. Besides, the weighted blanket can help you release stress and anxiety to make your relaxed. Choosing the suitable weight would make the most of the blanket.We recommend 36''x48'' and 41''x60'' for twin bed, 55''x82'' for queen bed, 80''x87'' for king bed. Due to its weight, it's not necessary to choose oversized blanket. ✅ 30 DAY STRESS-FREE GUARANTEE - Try your blanket risk-free for 30 days. If you're not 100% happy with your Active Corner weighted blanket, we will refund all of your money and collect the blanket for free. No questions asked. ✅ REDUCE STRESS & ANXIETY - Experience the natural calming effect of deep pressure therapy. Unlike other stress relief solutions, our weighted blanket provides immediate support to quickly reduce stress levels in adults and children alike. ✅ SLEEP BETTER - Throw our weighted blanket over yourself or your kids to provide the same calming support all night long. We've found in our own testing that both adults and kids wake up less often through the night and enjoy a deeper sleep with the assistance of our heavy blankets. And with our free minky pillowcase, your sleep will be that much better. ✅ BIG ENOUGH FOR EVERYONE - Our 60" x 80" blanket is the largest sized weighted blanket on the market. Great for tall people, or for fast-growing kids and teens to ensure a fit that'll last through the years. This is truly the king size weighted blanket. ✅ ADAPTABLE WEIGHT - Rather than buy a new weighted blanket every time you need to change the weight, simply utilize the size of our blanket to adjust the amount of weight actively in use. Need more weight? Fold our large blanket in half to double the effect. Need a lighter weight for younger children? Simply use a single half for a 6 lb blanket. 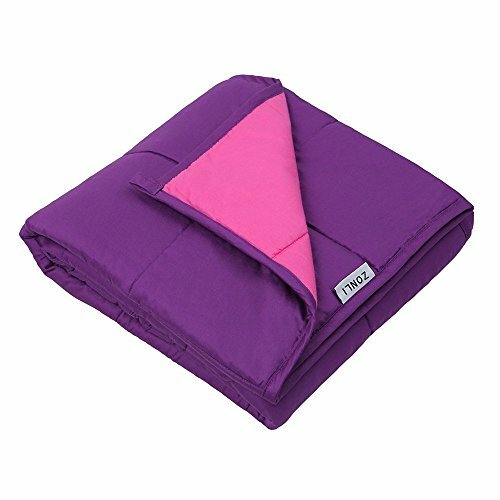 5 LB BLANKET FOR KIDS AROUND 50LB - A weighted blanket engineered to be 10% of your body weight to reduce anxiety and increase relaxation. EASY WASH - This 36"x48" weighted blanket comes as a two part construction. The soft dotted minky outer cover easily zips open allowing for a convenient wash and a quick drying process. EXCELLENT GIFT - Give your friends or loved ones the best gift of all - A better nights sleep. SAFE - Filled with 100% non-toxic glass pellets. Sleep well at night knowing that your child is in good hands. 100% SATISFACTION GUARANTEED! - We are so confident about the quality of our products, we will refund you purchase if you are not satisfied. No questions asked!  Quality - Our blankets have sensory-sensitive "minky dots" on one side and a Cashmere-like smooth texture on the other. Made with hypoallergenic fabric and designed to let gravity perform its magic to reduce stress and relieve anxiety.  Premium Value - Comes with BOTH Cover AND cotton Blanket. The cover is deluxe duvet style with security ties inside and flexible zip close. The blanket is weighted by small beads woven securely in quilted design. See Size scale to compare on twin, full, queen and king size beds.  Natural Remedy - Encourages stimulation of pressure points that trigger your brain to produce serotonin to naturally improve mood and relaxation. A holistic, non-drug technique to help manage physical and mood sensitivity as well as insomnia and ADHD. Supports an organic method for a good night sleep.  Considerate & Practical - Cover is conveniently machine washable cool and machine gentle warm tumble dry. Promotes easy personal hygiene to your loved ones, longevity of the blankets, plus fast convenience. Also if giving as a perfect practical gift - reduce anxiety for busy loved ones who does lbs of laundry.  Tactile Comfort - Provides a gentle and soft protective nook that simulates the perfect feeling of additional weight from throw, comforters and other plush covers with less heat in comparison. 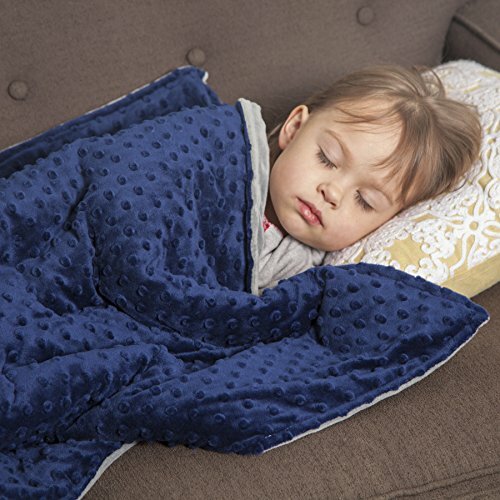 CALMING - Whether used during the day to provide just the right amount of calming pressure or at night to help your child fall asleep and stay asleep, our ZZZ Weighted Blanket is specially designed to provide the calming sensation your child needs. WEIGHTING - The inner quilt is 5, 7, or 10 lbs and the outer duvet adds an additional 1.5 lbs. EASY TO CLEAN - Simply unzip the cover and wash and dry the soft blanket in your clothes washer. Other brands of blankets are all one piece and can be a nightmare to clean and can't be put in the wash. But with ours, just unzip and throw it in the wash. PREMIUM MATERIALS - We use super comfortable and soft cotton and polyester - just like your clothes. Some competing brands fill the blanket with sand to provide the weight. Who wants sand all over their child's bed! Stick with ZZZ Weighted Blankets for cotton and polyester. PERFECT COLOR - Many studies confirm blue is mentally calming. The outside is a columbia blue with raised dots. We blended a sea green and aqua for the inside to create the perfect calming color combination.. EVEN WEIGHT DISTRIBUTION - NOTE: The inner quilted blanket is attached to the outer duvet with 6 ties. You may need to retie some of these more tightly prior to use to make sure the inner blanket stays perfectly in place. Quilted squares inside keep the weight distribution even throughout the blanket. Competing brands missing these quilted squares lead to heavy and light spots, but ZZZ Weighted Blankets keep the weight evenly distributed for the maximum calming effect. We found the weighted blanket that we bought for our son, really calms his condition at night. He sleeps better and wakes up in a better mood after a good nights sleep. We found he liked the really heavy blanket, the heavier the better for him. I hope you find this information helpful and we hope a weighted blanket can help relieve the stress and anxiety your son or daughter is feeling.